Successful adaptation requires governments to change their investment, planning and policy processes. To support these actions, practitioners must engage with governance processes and identify the barriers and opportunities for climate adaptation mainstreaming. However, when tackling climate change, governments often do not fully consider how to integrate climate change resilience building into their decision making. This ACT Learning Paper* describes a framework that allows governments to integrate climate change adaptation into governance systems, policies and plans. 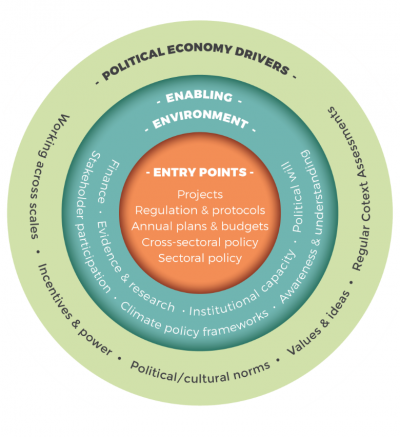 Developed and launched by a group of national and international climate change experts between 2016-2018, the framework identifies barriers and opportunities for climate adaptation mainstreaming and has already helped 10 national and sub-national governments—including four South Asian countries (India, Pakistan, Nepal and Afghanistan)—change their investment, planning and policy processes to account for climate change. Entry points: Opportunities for integrating climate considerations into the planning and policy process. Enabling environment: The characteristics – people, institutions, resources etc – that help support the successful adoption of climate change adaptation policies and practices. Political economy drivers: The factors that influence and affect the enabling environment such as the interests and incentives facing different groups as well as formal and informal social, political and cultural norms. The lessons from this work will be of interest for similar projects and programmes in the region and beyond. Understand governance challenges and constraints: Any adaptation project should consider issues related to institutional capacity, political will, and existing policy frameworks. This enabling environment should be assessed and regularly monitored, to identify potential governance risks and opportunities. ACT has done this through annual context assessment exercises. A supportive enabling environment is crucial: Integrating climate change into policy and plans will only succeed if measures are supported by sufficient resources, capacity and capabilities to implement and monitor the initiatives. ACT has focused on this by enabling access to finance and information, mobilising key stakeholders and political will, as well as supporting the development of the right policy frameworks and strengthening institutional capacity. Political economy drivers cannot be ignored: Projects should identify and understand the relative influence of different stakeholders within the system, as well as formal and informal institutions, norms and values. This helps to define the best formal and/or informal approach to influencing the government. ACT has operationalised this by using a variety of Political Economy Analysis tools. Governance occurs at multiple levels: Successful adaptation at one level of policy making will need to be supported by good governance at other levels. Therefore, ACT works at the national as well as sub-national levels across South Asia. Different entry points for adaptation should be used: Policy entry points for adaptation measures that are easiest to access (and where there is demand and interest from government), are not always those that have the highest returns. This is why ACT has strategically used a wide variety of ‘easy’ and ‘difficult’ entry-points to achieve the overall objective. See the full paper for more lessons and much more detail. Read "Climate-Resilient Water Management: An operational framework from South Asia"